Welcome to Our DIY House in the Spring! 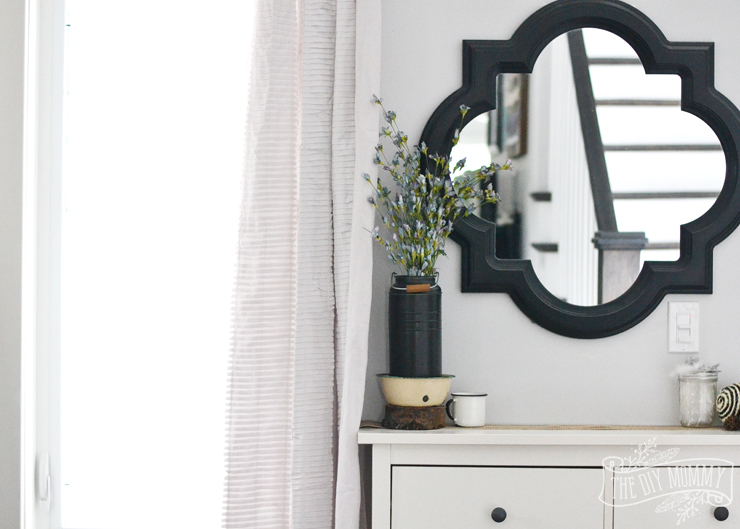 To me, springtime is all about new beginnings and the addition of exciting new bursts of colour and life, so I really wanted to portray that in our home’s decor this year. 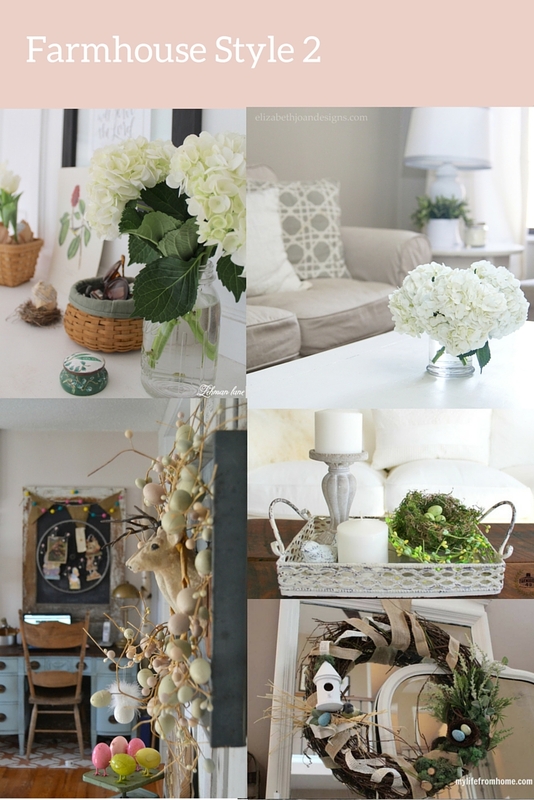 Today I’m giving you a virtual tour of a few rooms in our house that I’ve decorated for the new season. 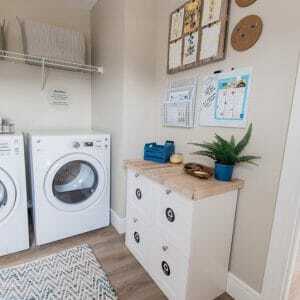 I’ll also share some easy DIY and styling tips so that you can try out these ideas in your own home if you like them. As I often like to do, lots of our decor this Spring is inspired by nature, and it’s an eclectic mix of vintage and modern. Grab yourself a latte, and come on in! 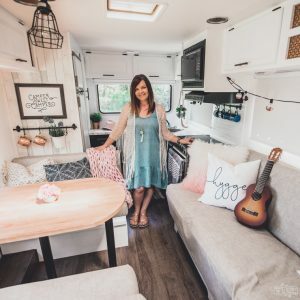 I’m very excited to be a part of the Spring Fling Home Tour blog hop this week, so make sure to scroll down to the bottom of this post to see who else is sharing their home decor today. 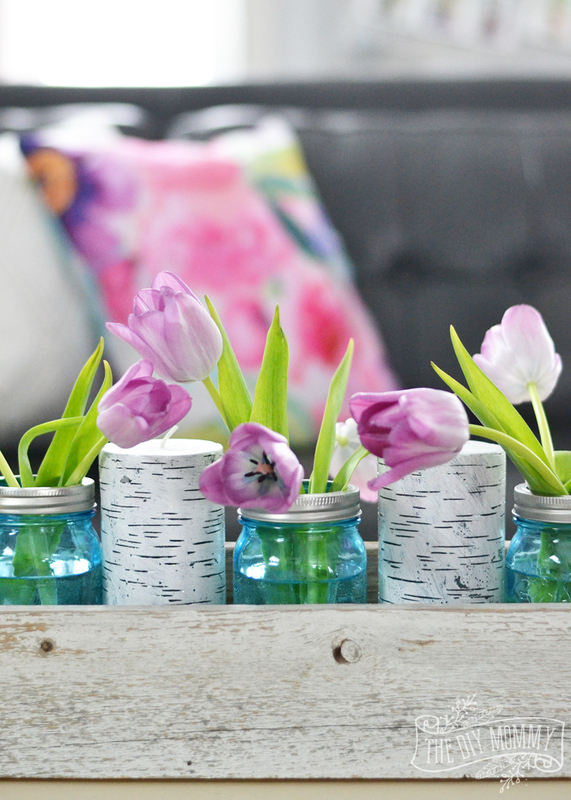 There’s bound to be a ton of inspiration for Spring decor! Also, make sure to enter The Brick‘s newest contest – Flip it to Win! I’ll share more about it later in this tour post, but you can win a ton of fantastic prizes like a $5000 shopping spree, a trip to Mexico (!! 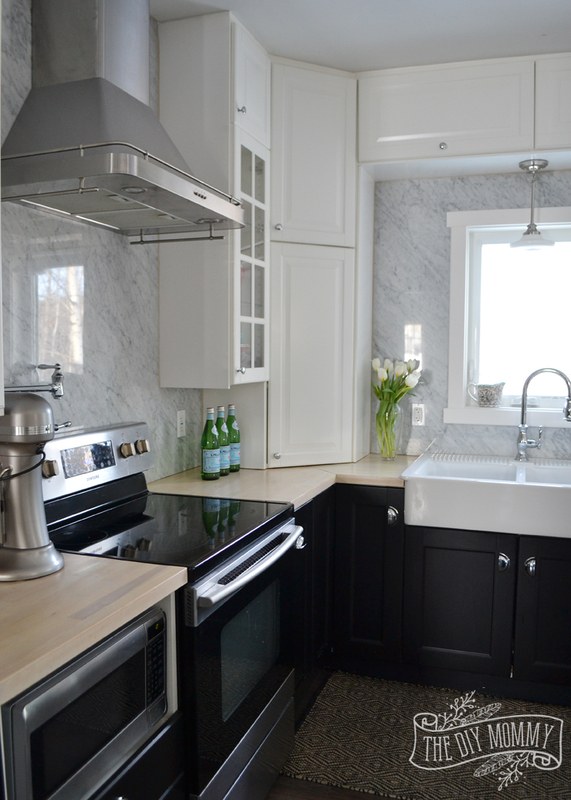 ), or a dream kitchen appliance package. If you’re new here, you might want to read the story of Our DIY House – we built it from the foundation up all on our own in 2013. It was quite the adventure! I’ve kept our little entry nook simple with some of my favourite little antique items and a pretty bundle of faux flowers. Moving into our living room, I’ve added some bright pops of colour to make it feel fresh and ready for the new season. Styling Tip: One single floral pillow adds enough of a burst of colour and pattern to make an entire room feel like Spring! 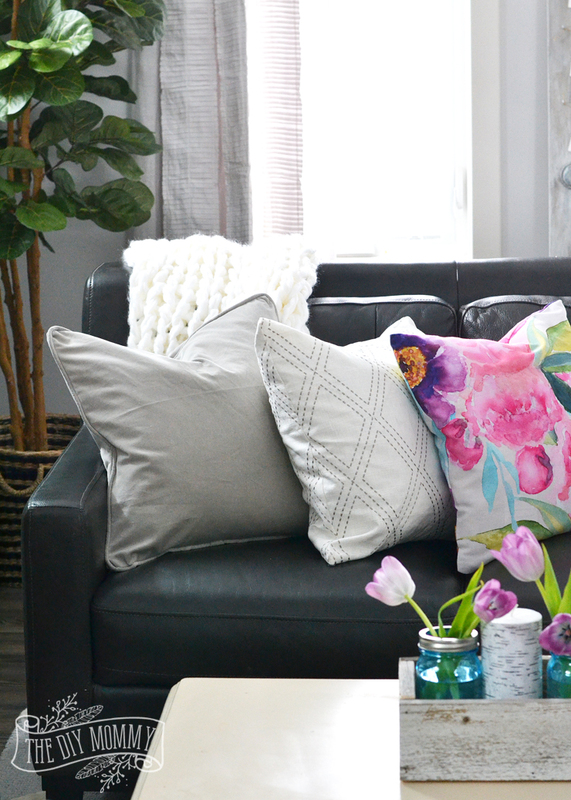 This bright floral pillow is designed by one of my favourite fellow Canadian bloggers – Lucy of Craftberry Bush – and you can find it here. I took my colour cues from this pillow, and added little bursts of turquoise (always my favourite!) and bright pink colours throughout our living room. 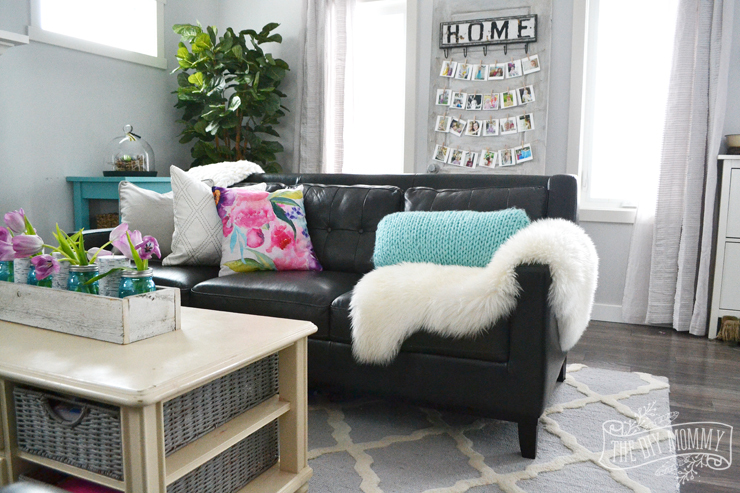 Styling Tip: To make a dark leather couch feel lighter, surround it with light and bright colours like white and gray. 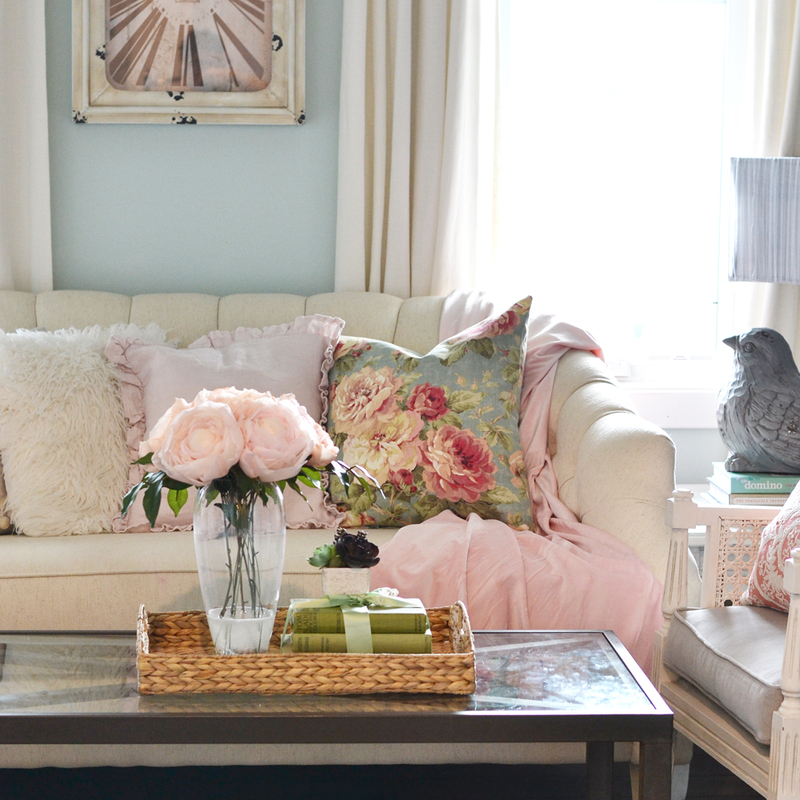 You can also pile white and coloured throw pillows to make it feel instantly brighter. I’m still really happy with how these have held up to our busy family shenanigans and the more we use them, the comfier they get. 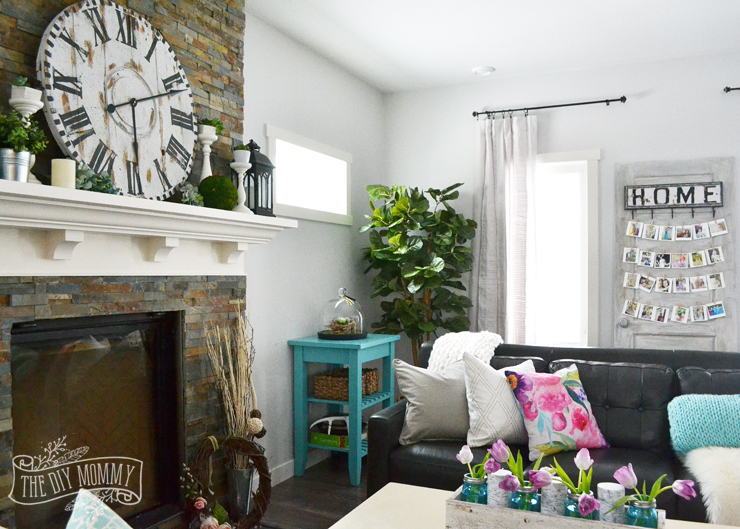 And I can’t forget to tell you about this clock on our Spring mantel! It’s my latest DIY and I couldn’t be happier with it. 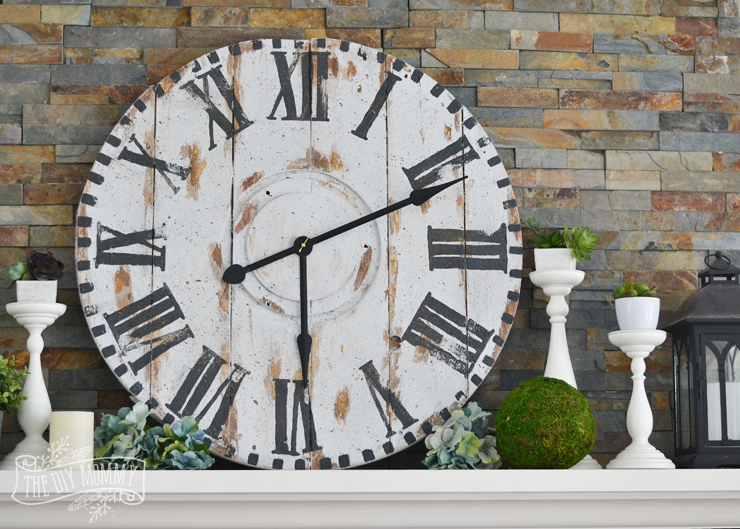 Click here to see how to make a giant DIY reclaimed wooden clock like this. 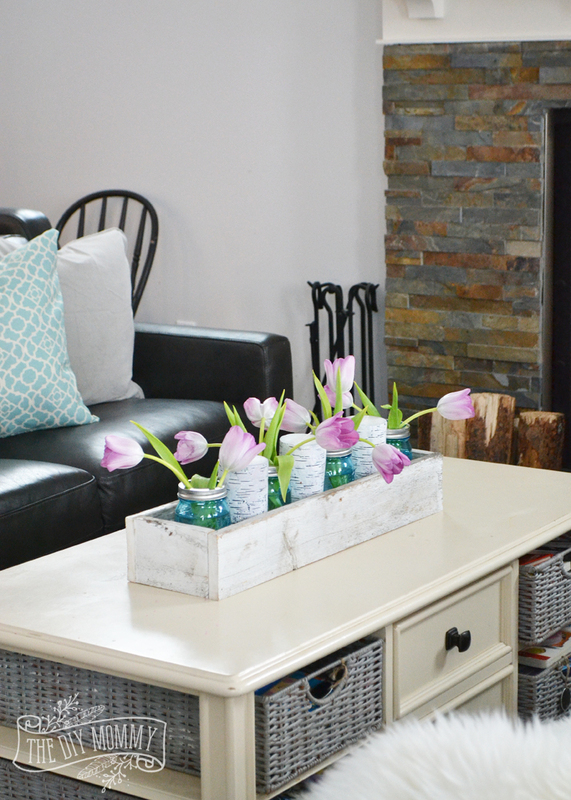 On our coffee table, I’ve filled a barnwood box with blue mason jars, candles and pink tulips. Is there any flower more happy looking than a pink tulip? 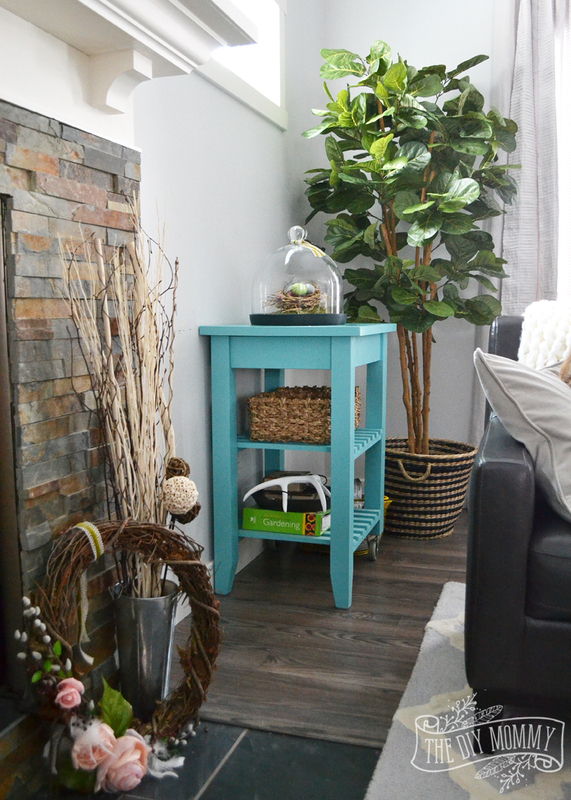 The corner of our living room has a new little friend – this faux fiddle leaf fig tree. I really like how realistic it looks, and it adds a much needed dose of green in this back corner. 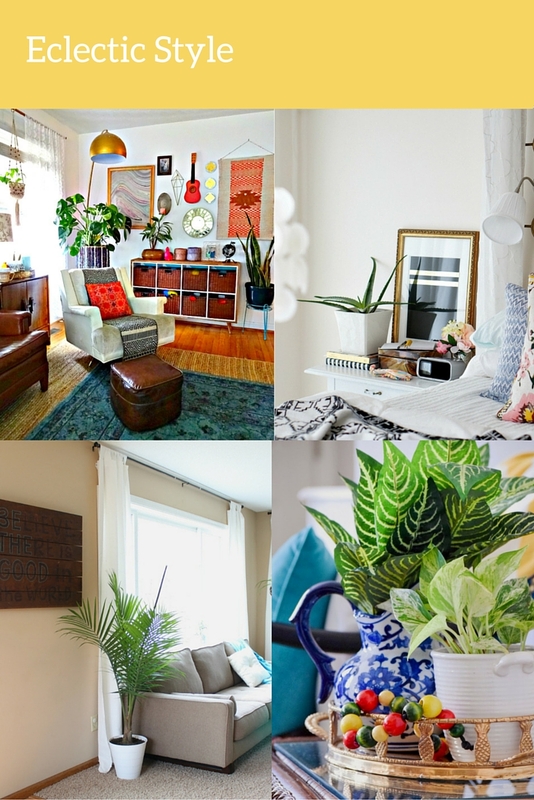 Styling Tip: Mix faux greenery and florals with real ones for a lower budget look for Spring. 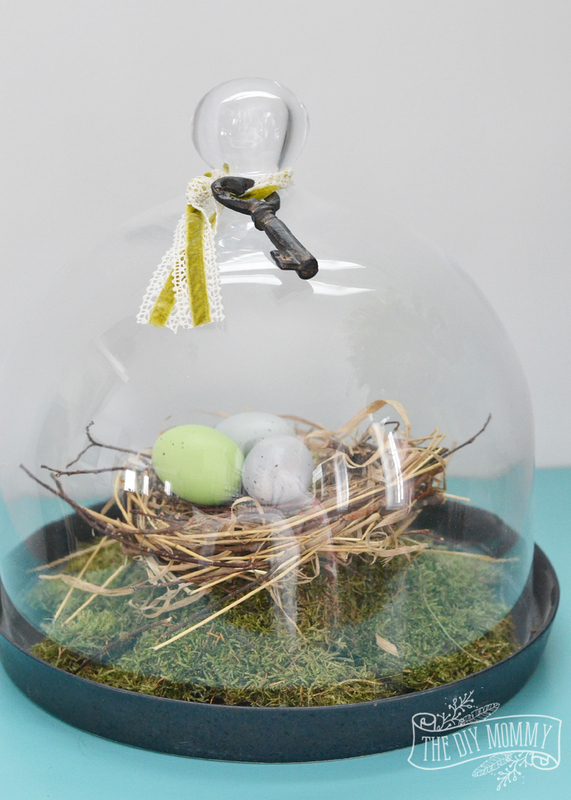 On my little turquoise cart is the DIY bird’s nest my girls and I made last year. The table is set with simple nature-inspired accents for Spring. You can find more details on my Spring table setting right here. 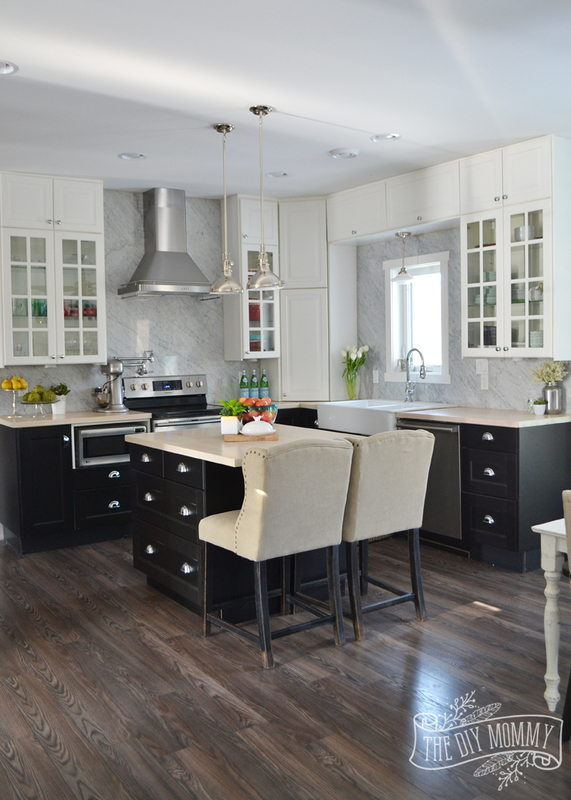 The rest of the kitchen features little bursts of fresh fruit, veggies, and of course a sweet little bundle of tulips. 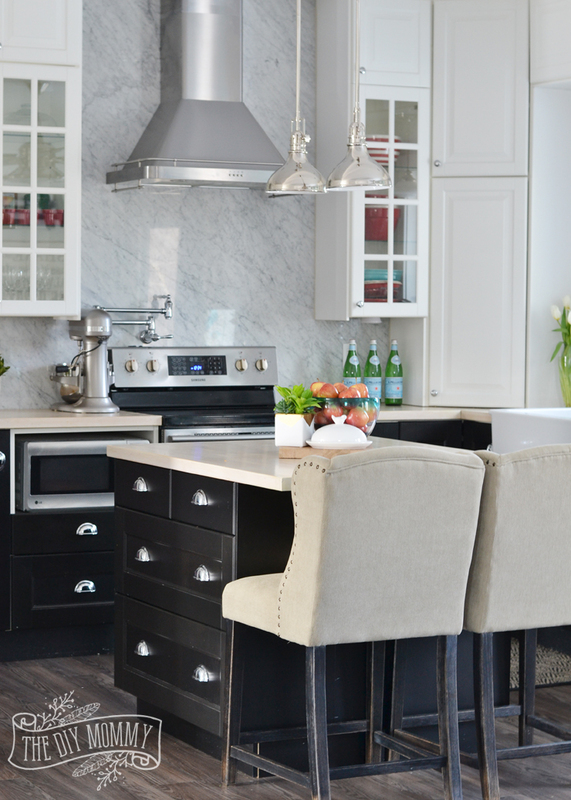 Our new island stools are the Moriann Wingback Counter Stools from The Brick, and they’ve been a great addition to our family-friendly kitchen. The girls love to sit on them for snack time, and I think they look just as good with my colourful teal floral drapes as they did with the red plaid ones I had here at Christmas time. The bronze nail accents are my favourite feature! 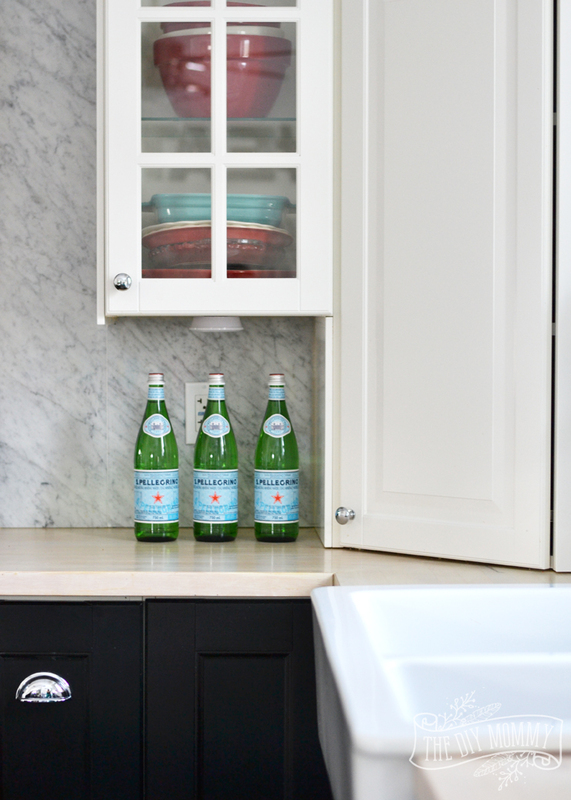 Moving into the heart of the kitchen, the cupboards are washed and ready for some Easter baking! 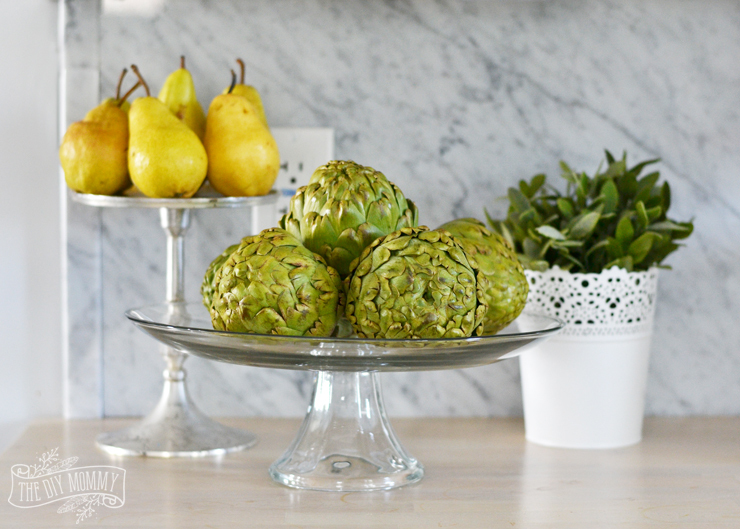 Styling Tip: Decorate your kitchen counter tops with interesting looking fruit and vegetables that match your decor like artichokes. Layer them at different heights with cake stands. I still definitely need to do a good, thorough Spring clean on the inside of my kitchen cupboards, but that’s still on the back burner… I’m definitely a bit (OK, a lot!) 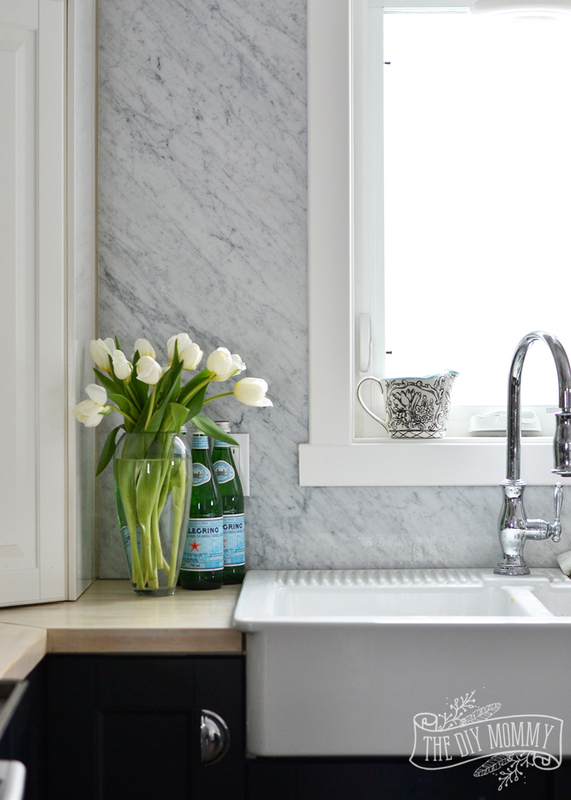 of a procrastinator when it comes to a good Spring clean! 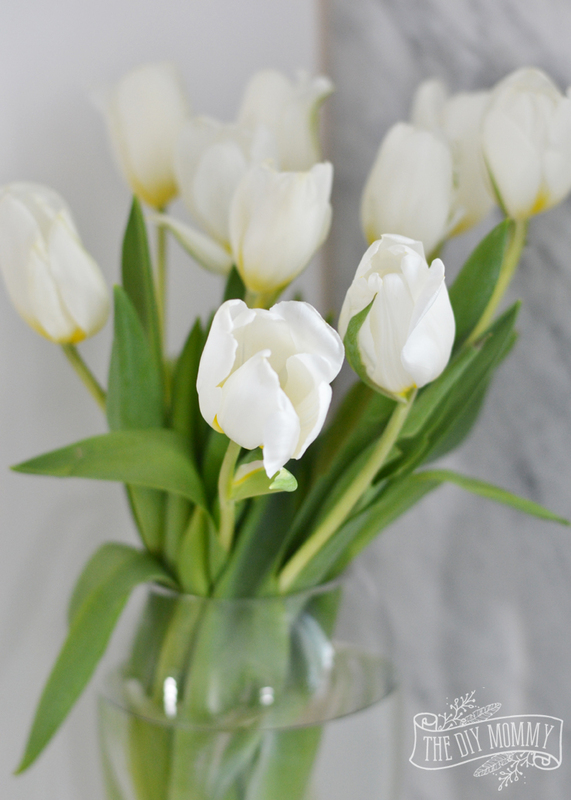 I love this time of year when a bundle of tulips at the grocery store is so easy to find! 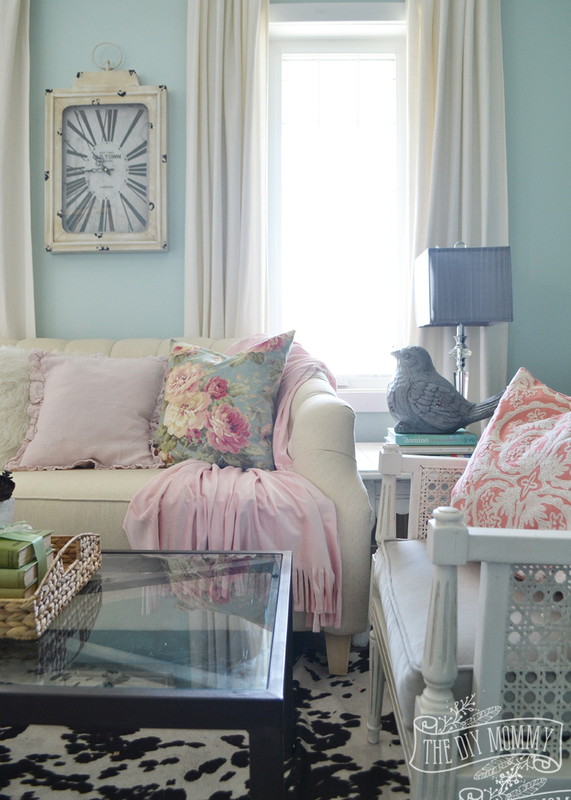 Now, moving on to the final room I wanted to share with you today: our formal sitting room. 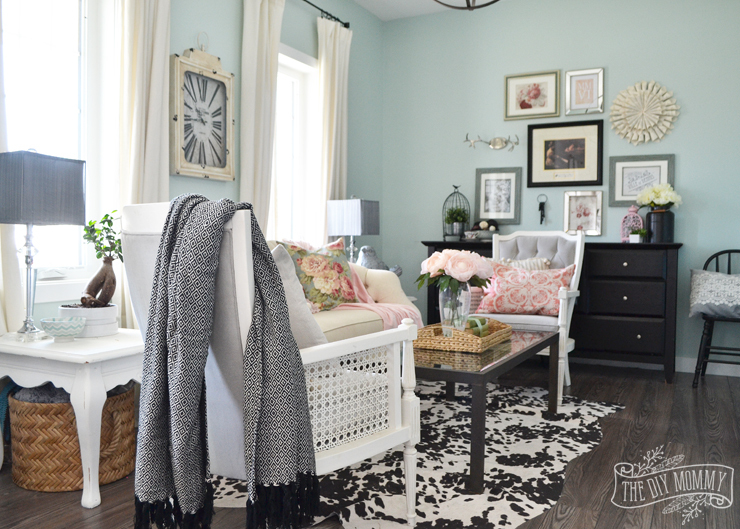 This has been one of my favourite rooms to decorate for Spring because of the wall colour and the fact that it’s a room that always looks good with pink accents. 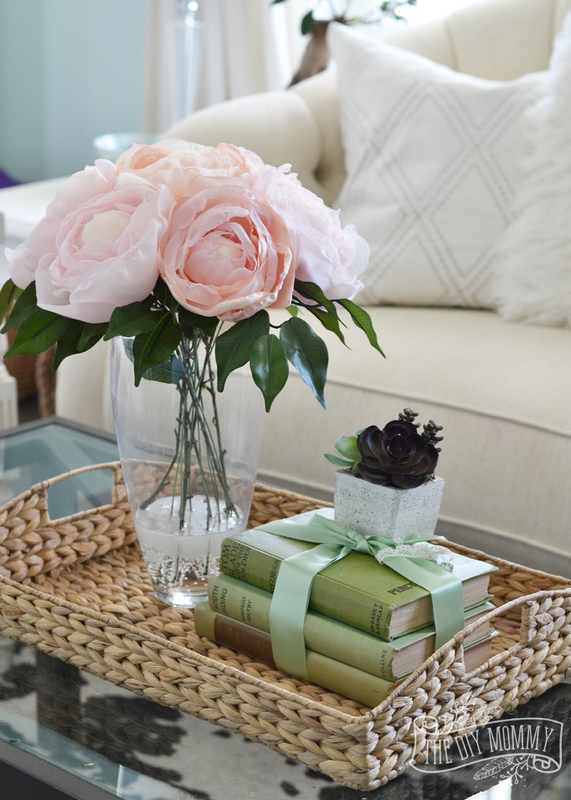 I made these flowers using this DIY method right here, and then I set them in a glass vase with acrylic water. Styling Tip: Fill a transparent glass vase with real or acrylic water when using faux florals to give them a more realistic look. 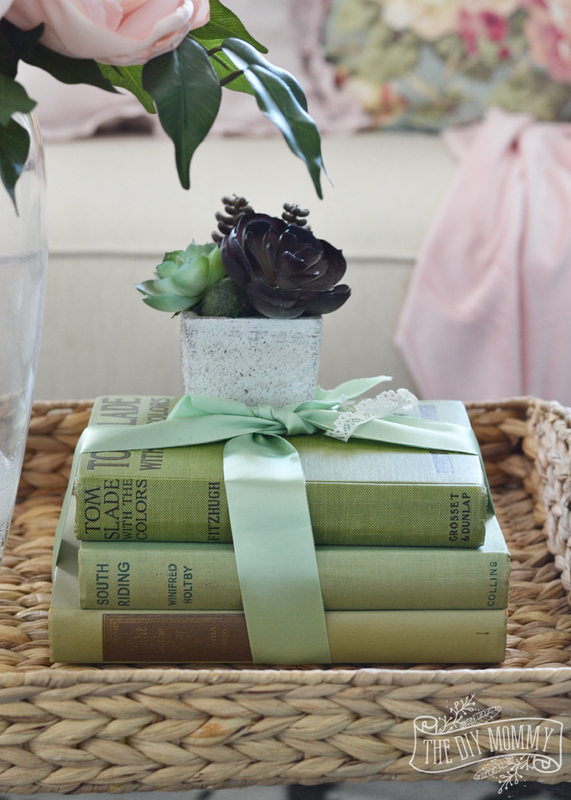 The books on the tray on the sitting room coffee table are a fun vintage find from an antique store trip this month. I love their spring-green colour! 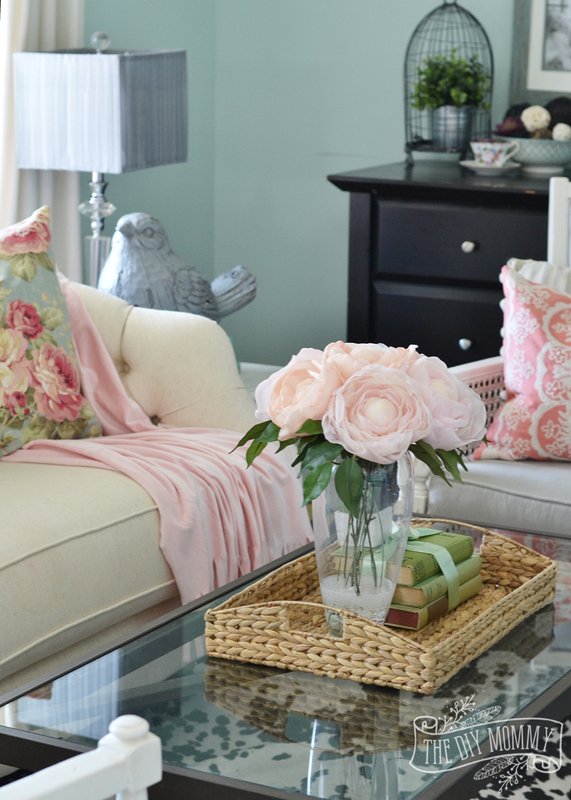 A simple DIY pink throw and floral pillow add just the right amount of Spring pop to the room. I used this method to make the floral pillow so that it was nice and quick! 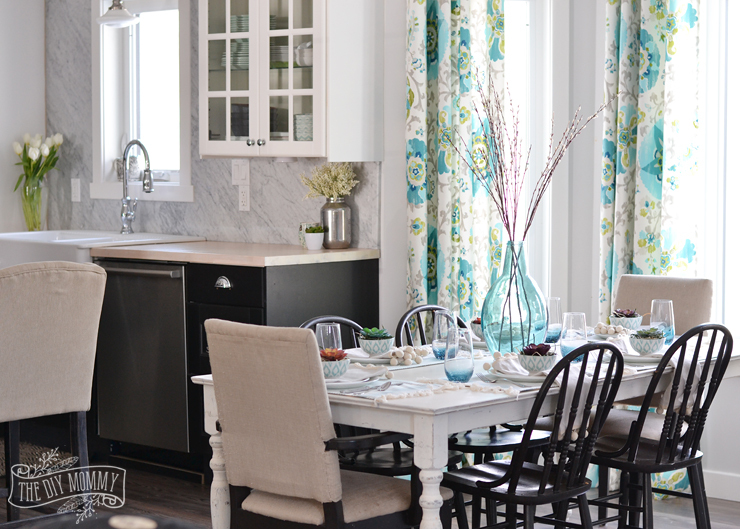 Do you like this vintage-inspired decor look? The Julia sofa from The Brick has the tufted, traditional look that I love and it has a very similar feel to the pieces I have in our sitting room! 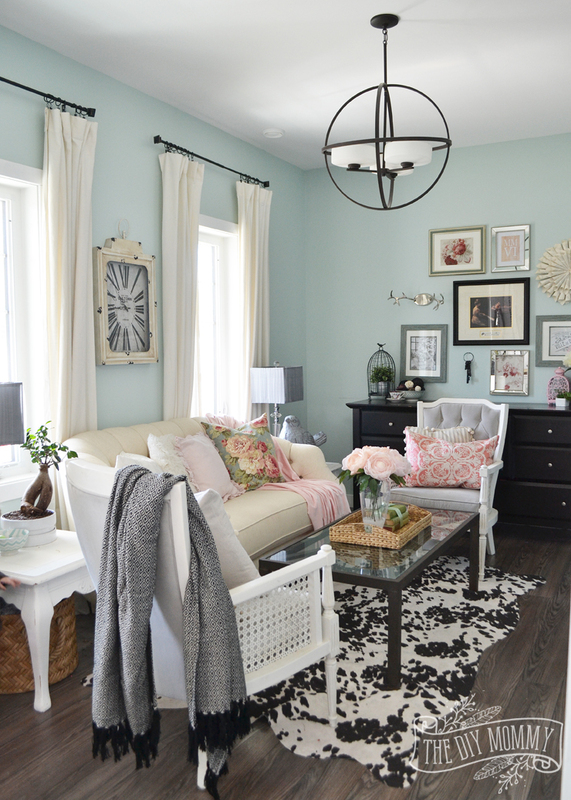 I truly love the mix of black, white, blush pink and Spring green in this room. It’s colourful, but it’s still soft. 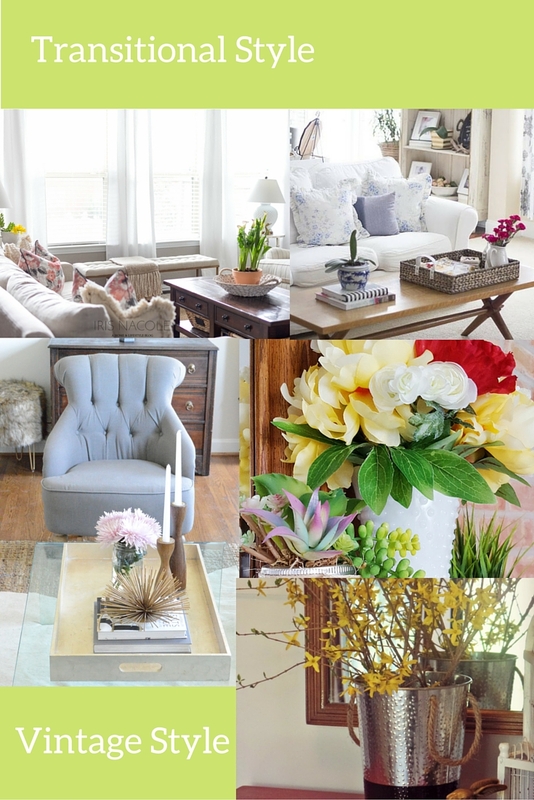 Are you longing for a Spring home decor refresh this month? Make sure to enter The Brick’s Prize Couch Flip it to Win! My friends at The Brick are giving away a TON of great prizes like a Big Brother Canada Ultimate Fan Experience, a gorgeous new TV, a $5000 shopping spree and more. Click here to play! 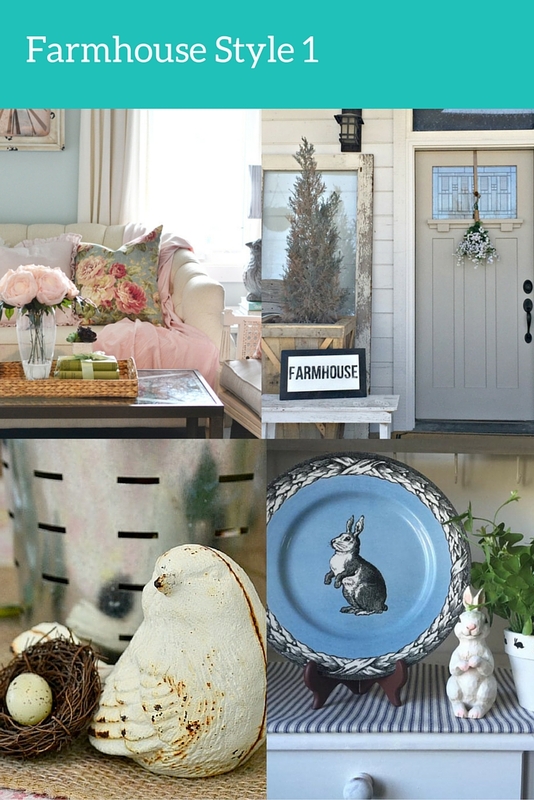 Now it’s time to visit the other bloggers’ homes that are all decked out for Spring! Love your home. 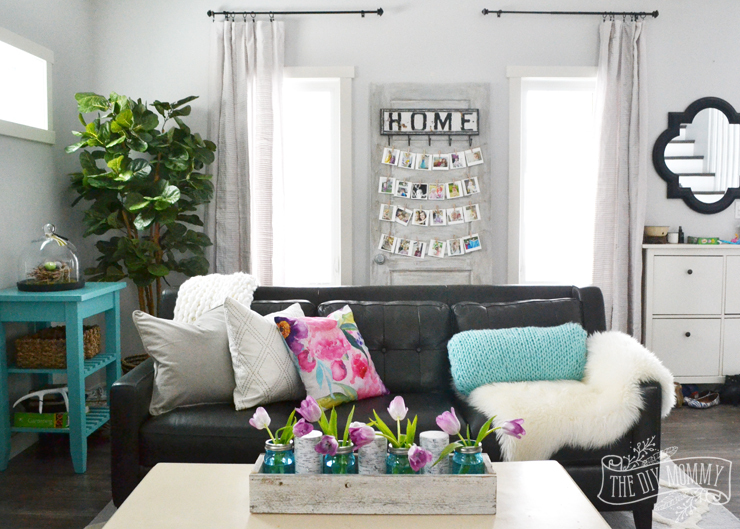 The placement of bright colored pillows and flowers really makes it feel like spring. 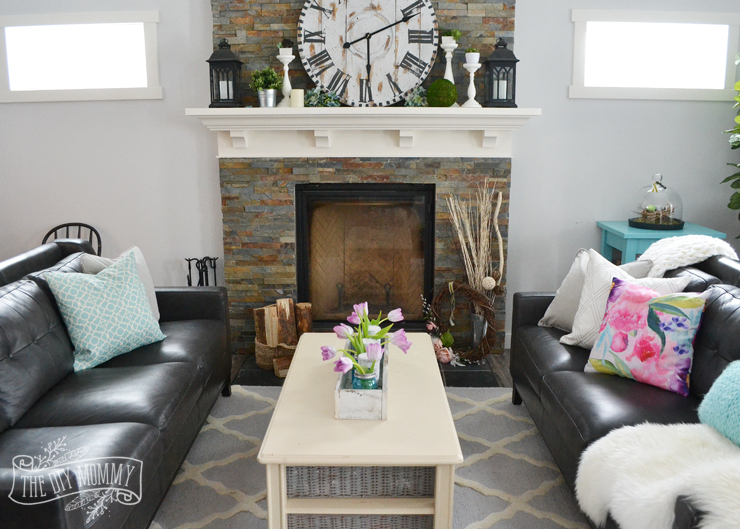 Love your diy mantel clock. 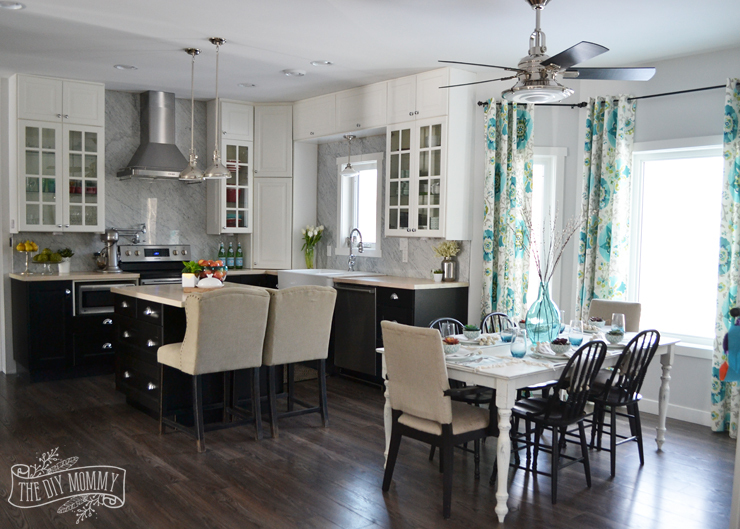 Everything looks so cheerful and airy! I just love that beautiful house my friend! PS. Popped into Country Pumpkin yesterday and thought of you, such a cute shop! We need to have a Spring antiquing day soon!!! 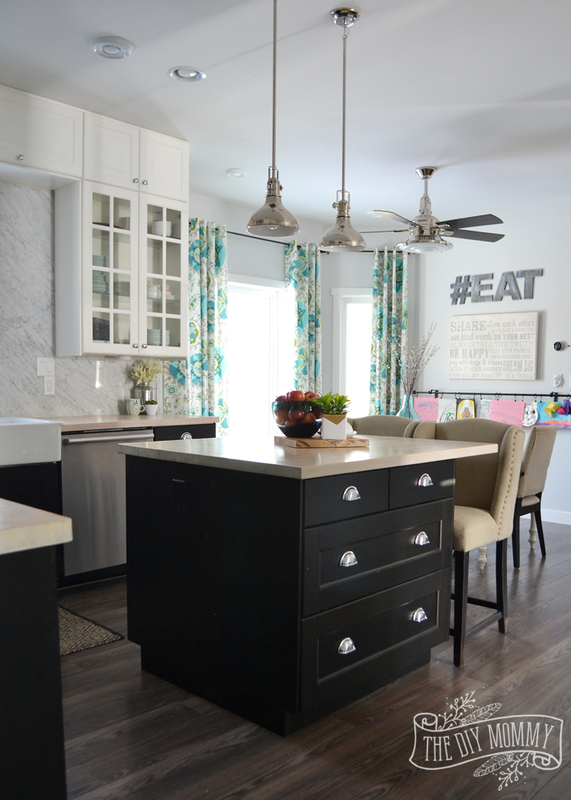 Christina, I adore your take on Farmhouse style. It is modernized, chic, and so beautiful. I especially love the family centered decor like the door photo display and kids artwork gallery in the dining area. Your style is amazing. Pinning and sharing!! Your home is So, SO beautiful. Love all the turquoise and pink! 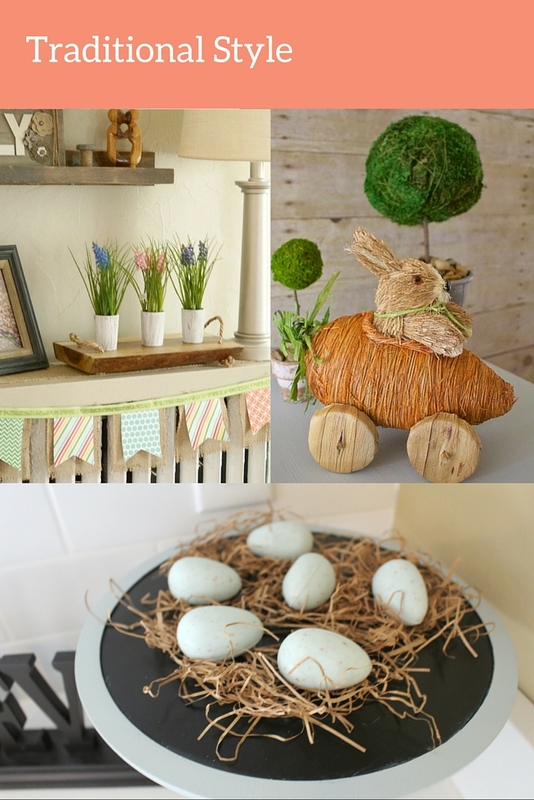 Your home is perfectly ready for spring! So inviting, warm and cozy! It has been fun touring with you this week! Absolutely gorgeous! Your formal sitting room just makes me swoon. 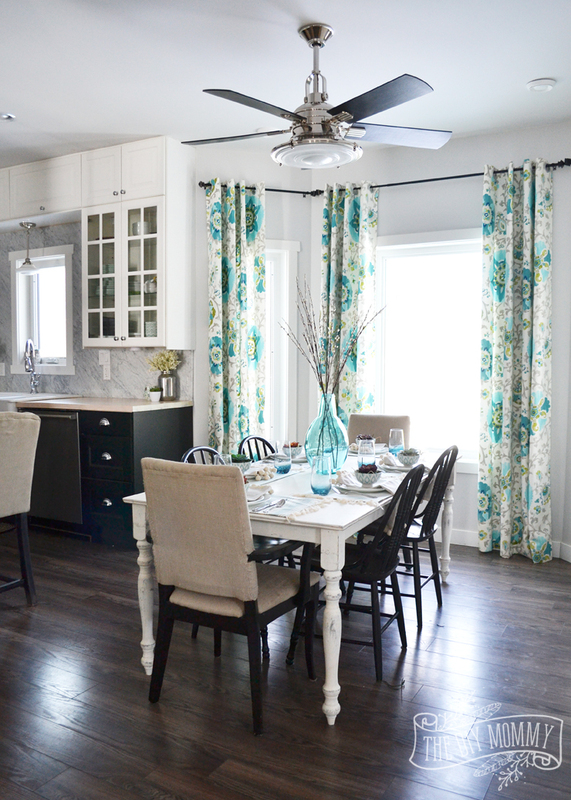 The colors are so pretty and the room is inviting – not too formal. Love the colors and accessories you’ve chosen. Your house is so beautiful! 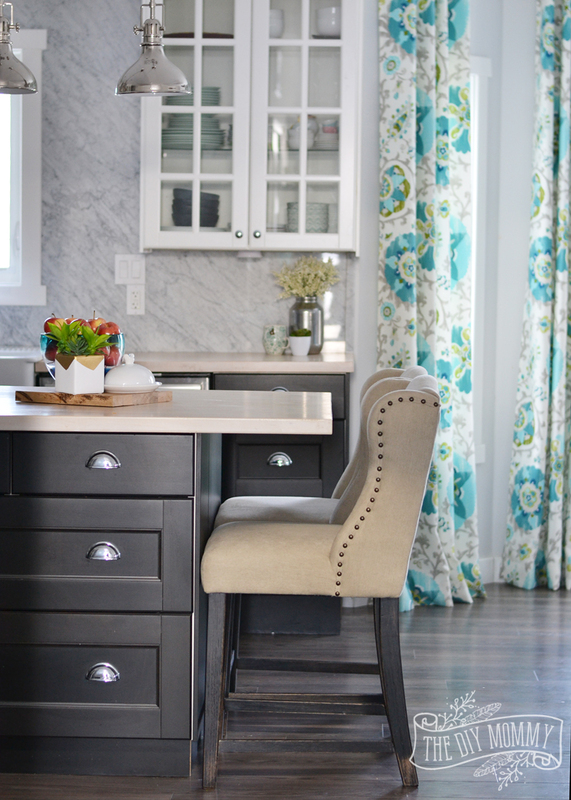 I love all the turquoise you have incorporated into your decor! You have one of my favorite homes, it always looks so lovely!! Your home looks great, Christina! Very welcoming and cozy. Love all of the pops of color! 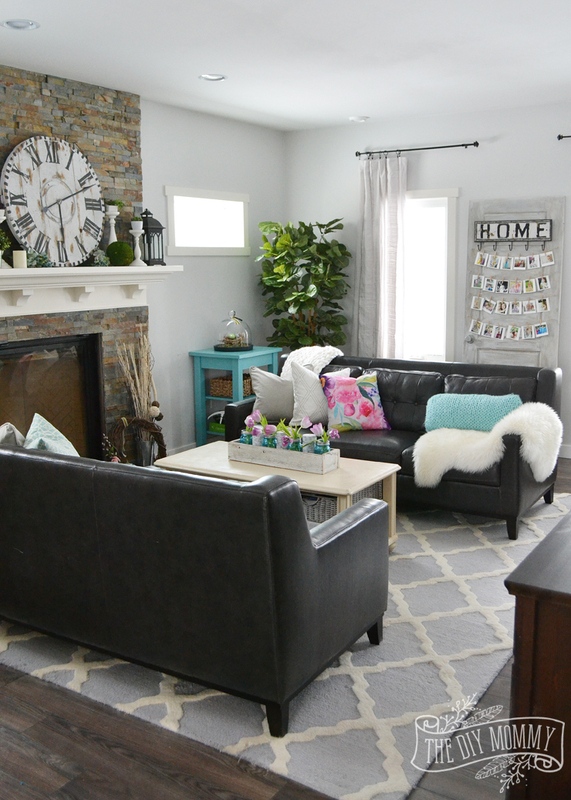 Your home looks so lovely, Christina! I love that tulips, that floral watercolor pillow, and the clock on your mantel. It was great sharing the tour with you. Happy spring! What a beautiful room! 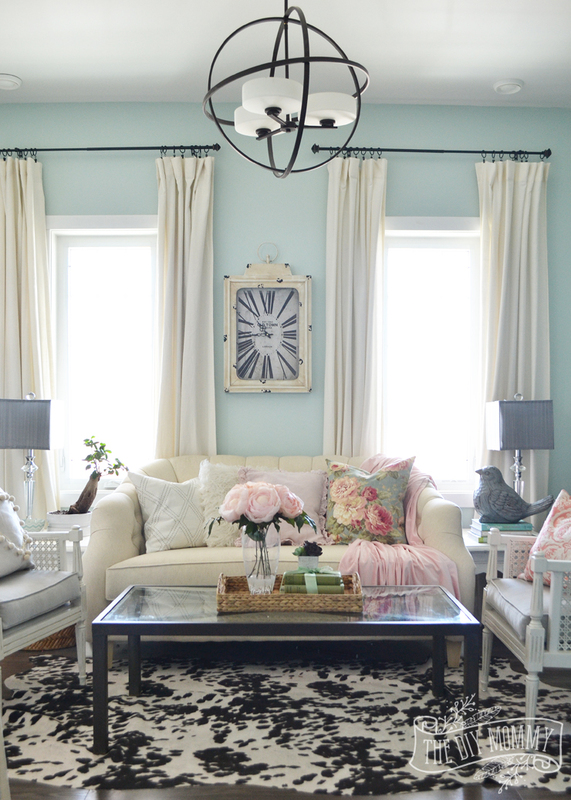 Can you tell me the paint color and brand name of the paint you used in your formal living room? 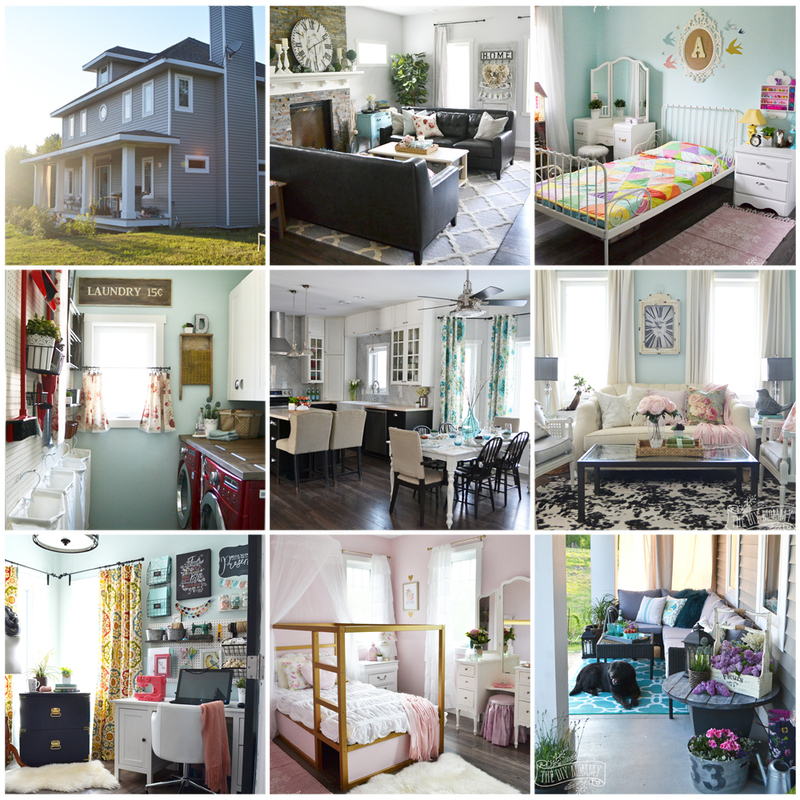 Beautiful home and pictures! I am so inspired by your work. Thanks a lot for sharing the great article.